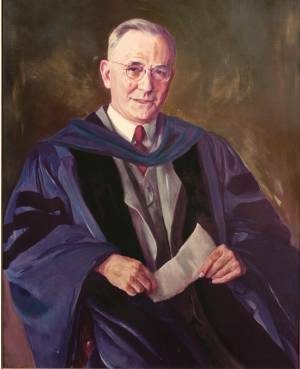 John Richie Schultz was the first Allegheny president who was not a member of the clergy and the third to accede to that post from the faculty (fourth, if John Barker, who briefly left for another institution, is counted in addition to Homer Clark and Wilbur Williams). A native of Canton, Missouri, where he was born on December 12, 1884, Schultz was drawn to the writings of another favorite son of that region, Samuel Langhorne Clemens. Schultz also savored provin­cial speech, especially the argot of the river men. He was a master pun­ster and took delight in writing poems in doggerel. His lengthy mock ode “Faculty Parade,” with which he entertained a faculty dinner in 1936, poked friendly fun at the fads and foibles of the College family. Schultz was a model citizen of the College and town. High-spirited and public-minded, his interest was for the general good. His outward conviviality was matched by an inward concern for others. He enjoyed people and wished them to enjoy Allegheny. During the grim years of World War II he worked to make the campus a source of warmth for the soldiers training there. Off campus, he served as member of the Mead­ville Civil Service Commission. “Richie,” as he was known, received his Bachelor of Arts degree from Culver-Stockton College in Canton in 1905, where he was elected to Phi Beta Kappa. He went on to earn his Masters of Arts and Doctor of Philosophy degrees from Yale in 1909 and 1917. From 1905 to 1908 Schultz was principal of Canton High School and also served as city clerk. From 1909 to 1911 he taught at East St. Louis High. The following year he returned to Yale as an instructor of English while completing his doctorate. He came to Allegheny as professor of Eng­lish literature in 1917. During the summers in the 1920s Schultz was adminis­tra­tor of Redpath Chautauqua, first for its Midwest lecture circuit, then for New York­ and New England. The many associations he developed while with the Chautauqua organization enabled him to bring to campus acclaimed contemporary cultural and literary figures such as Carl Sandburg, Vachel Lindsay, and Alan Lomax. He authored a collection of essays on literature, sever­al articles, and a book on The Unpublished Letters of Bayard Taylor. Schultz’s abil­ity to relate well with students brought his appointment to the post of dean of men in 1930. He was active in this role, became a friend to the fraternities, and built the significance of the position. To most of the campus and community Dean Schultz was a natural choice to be­come acting president upon William Tolley’s resignation in 1942. The trust­ees formally elected him president on May 8, 1943. His leadership during a period of uncertainty had a calming effect upon the College and community, strained by the challenges brought by war. Central to the president’s success was a friendly, “warm and fuzzy” style and an abili­ty to deal well with issues at hand and not to fret unduly over unsolv­able or future problems. Colleges including Allegheny, Culver-Stockton, Mount Union, and the Uni­versity of Pittsburgh awarded him honorary LLD Degrees. Happy and vigorous, he was suddenly attacked by cancer. Weak at commencement in 1947, he was soon unable to walk to Bentley Hall from his home at 380 North Main Street. He died on August 11, 1947. In 1992, what was formerly known as South Hall on the Alle­gheny campus was renamed Schultz Hall in his honor.